The United States of America has the highest incarceration rate in the world. With 716 people in prison for every 100,000, according to the International Centre for Prison Studies, that is a higher percentage of total population than any other country. Furthermore, based on a new report by the American Civil Liberties Union (ACLU), A Living Death: Sentence to Die Behind Bars for What?, there are more than 3,000 Americans serving life without parole for non-violent offenses. For some the offense that earned them life in prison was stealing tools from a shed or being the middleman in a $10 marijuana sale. The ACLU estimates that nationwide 65% are Black; while, in Louisiana, with its infamous Angola Prison, the number rises to 91%, a quantified testament to serious unresolved racism in the country. These numbers are appalling in their own terms but when they are compared to the prison populations of other countries, the ‘land of the free’ becomes an even more frustratingly antiquated trope for the United States. The United States leads the world in producing prisoners, a reflection of a relatively recent and now entirely distinctive American approach to crime and punishment. Americans are locked up for crimes — from writing bad checks to using drugs — that would rarely produce prison sentences in other countries. And in particular they are kept incarcerated far longer than prisoners in other nations. 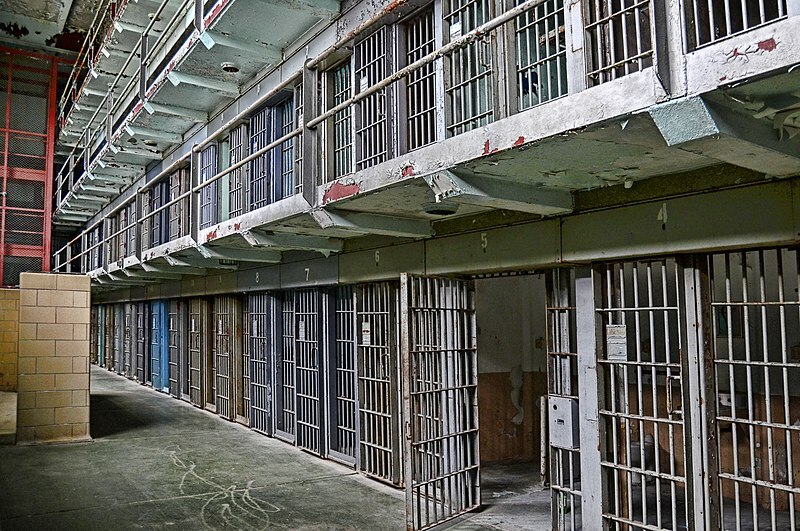 The United States incarcerates 716 people out of every 100,000 citizens. Liptak noted in 2008 that if only adults were factored into the count then the United States incarcerates 1 out of every 100 citizens. Following the United States in incarceration rates as a percentage of the national population is St. Kitts and Nevis with 649. Rwanda incarcerates 527 out of every 100,000 people, followed by Cuba with 510 and Russia with 490. Belarus holds 438 and Azerbaijan 407. Not a particularly glowing list of human rights respecting countries. While China incarcerates far less than the United States, 121 people for every 100,000, the country does boast the highest number of prisoner executions in the world, based on estimated figures in light of China’s refusal to make these numbers transparent. How do these figures compare with other democratic, advanced nations? Mexico holds 210 citizens per 100,000, and they are in the middle of a protracted civil war induced by the US led War on Drugs. Turkey holds 179 and the Czech Republic 154, while Argentina, Spain, and Scotland are tied at 147 per 100,000. The Netherlands and Switzerland both 82. Sweden incarcerates 67, while India only puts 30 out of every 100,000 people in prison. Sweden recently announced that it is closing four prisons and many remand centers in response to a drastic decline in the number of inmates, the result, many analysts are saying, of a robust emphasis on rehabilitation and lenient sentencing, a stark refutation of the deterrent argument lobbied by many in the United States in favor of the prison industrial complex. The estimated additional cost to US taxpayers, says the ACLU, for current life without parole incarceration levels is around 1.8 billion dollars, a sizable earning for the nation’s many privatized prisons. …today, the US is “virtually alone in its willingness to sentence non-violent offenders to die behind bars.” Life without parole for non-violent sentences has been ruled a violation of human rights by the European Court of Human Rights. The UK is one of only two countries in Europe that still metes out the penalty at all, and even then only in 49 cases of murder. The Huffington Post reported that the advance 2012 statistics by the Bureau of Justice Statistics notes that the prison population in the United States for the previous year was 1,571,013, which marks a decline for the third consecutive year. However, when local and city jails are included, the article continues, the population exceeds 2 million, 25 percent of the world’s prison population. The same ACLU report noted above puts the incarcerated population at around 2.3 million people. That number is difficult to fathom outside of abstractions that either gloss over or do not register the severity. This number does not reflect the millions others, family members and loved ones, whose lives are irrevocably changed or shattered by a belligerent and flawed criminal justice system. Recent studies such as the one by the ACLU should engender a serious national discussion on prison reform in the United States. But the narrative continues to be dominated by politicized interests and the manipulated discourses of fear and otherness. In an effort to lend more gravity to the discussion, below is a list of countries with entire national populations less than the US prison population. The following list has been composed using country population figures available through wikicommons. Prison population of the United States… around 2,300,000. 1. Namibia… 2,113,007. 2. Lesotho… 2,074,000. 3. Slovenia… 2,061,349. 4. Macedonia… 2,062,294. 5. Qatar… 2,035,106. 6. Botswana… 2,024,904. 7. Latvia… 2,014,000. 8. Gambia… 1,849,000. 9. Guinea-Bissau… 1,704,000. 10. Gabon… 1,672,000. 11. Equatorial Guinea… 1,622,000. 12. Trinidad and Tobago… 1,328,019. 13. Estonia… 1,286,540. 14. Mauritius… 1,257,900. 15. Swaziland… 1,250,000. 16. Bahrain… 1,234,571. 17. Timor-Leste… 1,066,409. 18. Djibouti… 864,618. 19. Cyprus… 862,000. 20. Fiji… 858,038. 21. Reunion (France)… 821,136. 22. Guyana… 784,894. 23. Bhutan… 740,740. 24. Comoros… 724,300. 25. Montenegro… 620,029. 26. Macau (China)… 582,000. 27. Western Sahara… 567,000. 28. Solomon Islands… 561,000. 29. Luxembourg… 537,000. 30. Suriname… 534,189. 31. Cape Verde… 491,875. 32. Malta… 416,055. 33. Guadeloupe (France)… 403,355. 34. Martinique (France)… 394,173. 35. Brunei… 393,162. 36. Bahamas… 351,461. 37. Iceland… 325,010. 38. Maldives… 317,280. 39. Belize… 312,971. 40. Barbados… 274,200. 41. French Polynesia (France)… 268,270. 42. Vanuatu… 264,652. 43. New Caledonia (France)… 258,958. 44. French Guiana (France)… 229,040. 45. Mayotte (France)… 212,600. 46. Samoa… 187,820. 47. Sao Tome and Principe… 187,356. 48. Saint Lucia… 166,526. 49. Guam (USA)… 159,358. 50. Curacao (Netherlands)… 150,563. 51. Saint Vincent and the Grenadines… 109,000. 52. Kiribati… 106,461. 53. United States Virgin Islands (USA)… 106,405. 54. Grenada… 103,328. 55. Tonga… 103,036. 56. Aruba (Netherlands)… 101,484. 57. Federated States of Micronesia… 101,351. 58. Jersey (UK)… 97,857. 59. Seychelles… 90,945. 60. Antigua and Barbuda… 86,295. 61. Isle of Man (UK)… 84,497. 62. Andorra… 76,246. 63. Dominica… 71,293. 64. Bermuda (UK)… 64,237. 65. Guernsey (UK)… 62,431. 66. Greenland (Denmark)… 56,370. 67. Marshall Islands… 56,086. 68. American Samoa (USA)… 55,519. 69. Cayman Islands (UK)… 55,456. 70. Saint Kitts and Nevis… 54,000. 71. Northern Mariana Islands (USA)… 53,883. 72. Faroe Islands (Denmark)… 48,509. 73. Sint Maarten (Netherlands)… 37,429. 74. Saint Martin (France)… 36,979. 75. Liechtenstein… 36,842, 76. Monaco… 36,136. 77. San Marino… 32,509. 78. Turks and Caicos Islands (UK)… 31,458. 79. Gibraltar (UK)… 29,752. 80. British Virgin Islands (UK)… 29,537. 81. Aland Islands (Finland)… 28,502. 82. Caribbean Netherlands (Netherlands)… 21,133. 83. Palau… 20,901. 84. Cook Islands (NZ)… 14,974. 85. Anguila (UK)… 13,452. 86. Wallis and Futuna (France)… 13,135. 87. Tuvalu… 11,323. 88. Nauru… 9,945. 89. Saint Barthelemy (France)… 8,938. 90. Saint Pierre and Miquelon (France)… 6,081. 91. Montserrat (UK)… 4,922. 92. Saint Helena, Ascension and Tristan da Cunha (UK)… 4,000. 93. Svaldbard and Jan Mayen (Norway)… 2,655. 94. Falkland Islands (UK)… 2,563. 95. Norfolk Island (Australia)… 2,302. 96. Christmas Island (Australia)… 2,072. 97. Niue (NZ)… 1,411. 98. Vatican City… 800. 99. Cocos (Keeling) Islands (Australia)… 550. 100. Pitcairn Islands (UK)… 56. Opponents of the movement for democracy in Burma have sought to undermine it by on the one hand casting aspersions on the competence of the people to judge what was best for the nation and on the other condemning the basic tenets of democracy as un-Burmese. There is nothing new in Third World governments seeking to justify and perpetuate authoritarian rule by denouncing liberal democratic principles as alien. By implication they claim for themselves the official and sole right to decide what does or does not conform to indigenous cultural norms. This excerpt was taken from a version of the essay appearing in Freedom From Fear: And Other Writing (2010) p. 170-173. The Buddhist view of kingship does not invest the ruler with the divine right to govern the realm as he pleases. He is expected to observe the Ten Duties of Kings, the Seven Safeguards against Decline, the Four Assistances to the People, and to be guided by numerous other codes of conduct such as the Twelve Practices of Rulers, the Six Attributes of Leaders, the Eight Virtues of Kings and the Four Ways to Overcome Peril. There is logic to a tradition which includes the king among the five enemies or perils and which subscribes to many sets of moral instructions for the edification of those in positions of authority. The people of Burma have had much experience of despotic rule and possess a great awareness of the unhappy gap that can exist between the theory and practice of government. The Ten Duties of Kings are widely known and generally accepted as a yardstick which could be applied just as well to modern government as to the first monarch of the world. The duties are: liberality, morality, self-sacrifice, integrity, kindness, austerity, non-anger, non-violence, forbearance and non-opposition (to the will of the people). The first duty of liberality (dana) which demands that a ruler should contribute generously towards the welfare of the people makes the tacit assumption that a government should have the competence to provide adequately for its citizens. In the context of modern politics, one of the prime duties of a responsible administration would be to ensure the economic security of the state. Morality (sila) in traditional Buddhist terms is based on the observance of the five precepts, which entails refraining from destruction of life, theft, adultery, falsehood and indulgence in intoxicants. The ruler must bear a high moral character to win the respect and trust of the people, to ensure their happiness and prosperity and to provide a proper example. When the king does not observe the dhamma, state functionaries become corrupt, and when state functionaries are corrupt the people are caused much suffering. It is further believed that an unrighteous king brings down calamity on the land. The root of a nation’s misfortunes has to be sought in the moral failings of the government. The third duty, paricagga, is sometimes translated as generosity and sometime as self-sacrifice. The former would constitute a duplication of the first duty, dana, so self-sacrifice as the ultimate generosity which gives up all for the sake of the people would appear the more satisfactory interpretation. The concept of selfless public service is sometimes illustrated by the story of the hermit Sumedha who took the vow of Buddhahood. In so doing he who could have realized the supreme liberation of nirvana in a single lifetime committed himself to countless incarnations that he might help other beings free themselves from suffering. Equally popular is the story of the lord of monkeys who sacrificed his life to save his subjects, including one who had always wished him harm and who was the eventual cause of his death. The good ruler sublimates his needs as an individual to the service of the nation. The duty of austerity (tapa) enjoins the king to adopt simple habits, to develop self-control and to practise spiritual discipline. The self-indulgent ruler who enjoys an extravagant lifestyle and ignores the spiritual need for austerity was no more acceptable at the time of the Mahasammata than he would be in Burma today. The seventh, eighth and ninth duties — non-anger (akkodha), non-violence (avihamsa) and forbearance (khanti) — could be said to be related. Because the displeasure of the powerful could have unhappy and far-reaching consequences, kings must not allow personal feelings of enmity and ill will to erupt into destructive anger and violence. It is incumbent on a ruler to develop the true forbearance which moves him to deal wisely and generously with the shortcomings and provocations of even those whom he could crush with impunity. Violence is totally contrary to the teachings of Buddhism. The good ruler vanquishes ill will with loving kindness, wickedness with virtue, parsimony with liberality, and falsehood with truth. The Emperor Ashoka who ruled his realm in accordance with the principles of non-violence and compassion is always held up as an ideal Buddhist king. A government should not attempt to enjoin submission through harshness and immoral force but should aim at dhamma-vijaya, a conquest by righteousness. The tenth duty of kings, non-opposition to the will of the people (avirodha), tends to be singled out as a Buddhist endorsement of democracy, supported by well-known stories from the Jakatas. Pawridasa, a monarch who acquired an unfortunate taste for human flesh, was forced to leave his kingdom because he would not heed the people’s demand that he should abandon his cannibalistic habits. A very different kind of ruler was the Buddha’s penultimate incarnation on earth, the pious King Vessantara. But he too was sent into exile when in the course of his strivings for the perfection of liberality he gave away the white elephant of the state without the consent of the people. The royal duty of non-opposition is a reminder that the legitimacy of government is founded on the consent of the people, who may withdraw their mandate at any time if they lose confidence in the ability of the ruler to serve their best interests.